Scholar and teacher Paul Wesley Chilcote provides a full and clear introduction to the dynamic faith of John and Charles Wesley. The vital theology of John is skillfully gleaned from his voluminous writings. The corresponding faith of Charles is culled from his enduring hymns. For students and general readers this book illuminates the vital balance the Wesleys found in Christian teaching that overcomes the often mutually exclusive options presented in other theological traditions. Chilcote shows that such a synthetic faith is not boring or irrelevant but transforming and life-giving, bringing together faith and works, Word and Spirit, the personal and the social, the head and the heart, mission and service. "Paul Chilcote writes a highly readable book that focuses and synthesizes the essence of Wesleyan theology. He presents experiences of the Christian life--including personal and social salvation, a person's inner relationship with God and the rituals of the church, and a renewed heart and outward good works--to demonstrate that they are not opposed to each other but are complementary for a mature faith in Christian community. Sermons of John Wesley and hymns of his brother, Charles, provide examples and grounding for Chilcote's themes. Questions at the end of each chapter make this an excellent individual or small group study resource. Both laypersons and professionals in the church who seek to get to the heart of Wesleyan theology--and their own--will find this book useful." "Paul Chilcote provides significant insight into the 'creative tensions' that existed in the theology of John and Charles Wesley and which often occur in the church of today. The Wesleys skillfully taught and lived a 'both/and' approach rather than an 'either-or' approach to the issues of faith vs. works, personal vs. social holiness, religion of the heart vs. religion of the head, acts of piety vs. acts of mercy, etc. This book brings to life the Wesleyan genius which strikes a balance between these potentially divisive points. Readers will understand why the Wesleyan movement is alive and growing worldwide today!" "Paul Chilcote has given us a wonderfully symmetrical introduction to the Wesleys' theology. Anyone interested in discovering or rediscovering the theology that shaped the heart of the movement known as Methodism would benefit greatly from this clearly written, lively and balanced book. Chilcote covers all the essential themes with grace and brevity. 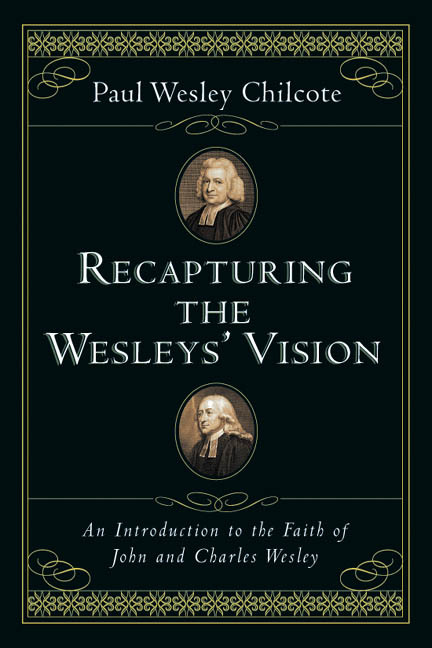 Recapturing the Wesleys' Vision is not only an excellent reminder of what Wesleyan theology was in the past, it is also a powerful plea for embracing the Wesleys' vision of the Christian faith as a reliable guide into the future." 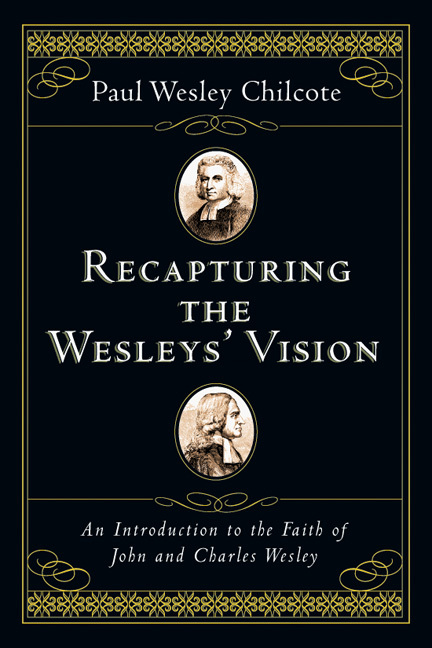 "Recapturing the Wesleys' Vision intentionally focuses on the truths of both Christianity and the life of Christians within the context of the central gospel message of the love of God. This book well develops the Wesleys' grand vision of the Christian life lived within a knowledge of God in Christ, and challenges the believer dynamically and creatively to live out the truths of that knowledge in an active faith. Here is indeed a masterful and compelling book by Paul Chilcote, building on his previous studies of the Wesleyan tradition and basing his writing on the Scriptures and on key Wesleyan texts. This work encourages the reader to embrace the Wesleyan balance of knowledge and vital piety, and makes readily available the joy of doing so." "John Wesley and his brother Charles are often portrayed as a kind of footnote in church history, representatives of an overly emotional religion that came along to counterbalance the excesses of dry, Protestant scholasticism. Paul Chilcote blows open this pigeonholing by showing the depth and balance of the Wesleys' theological apprehension of the gospel. This book will help a new generation of Christians appreciate the power and scope of that often underrepresented side of the Christian tradition, where human freedom is taken seriously as God's initiating grace is celebrated." "Paul Chilcote has given us a readable and inspiring introduction to the heart of the Wesleyan vision. His account of the Wesley brothers' 'both/and' approach to theology and practice has direct implications for the contemporary church. This book will not only inform but enable readers themselves to be drawn closer to God and neighbor and to grow in God's love." "This is an excellent introduction to the theological convictions and spiritual emphases of John and Charles Wesley. Chilcote captures faithfully the deep concern of the Wesley brothers to hold together dimensions of Christian faith and practice that are all too often cast in opposition, and he presents it in very accessible form. There is no better starting place for those who have been reminded by recent anniversary celebrations of the vital contributions of the Wesleys to begin to explore the beliefs and practices that undergirded their ministry." A challenging but manageable book, which many fellowship groups ought to obtain and make a mirror of self-examination. Paul Wesley Chilcote (MDiv, PhD, Duke University) is visiting professor of the practice of evangelism at Duke University. He previously taught at Africa University (Mutare, Africa), Asbury Theological Seminary (Florida), Wesley College (Bristol, UK), and the Methodist Theological School (Ohio). A clergy member of the North Indiana Methodist Church Conference, Chilcote has served parishes in both North Carolina and Indiana and has been active in global Methodism through his work with the World Methodist Council sponsored Oxford Institute of Methodist Theological Studies and the global Theological Education Committee. With his wife he served as a United Methodist missionary in Limuru, Kenya. He co-chairs the World Methodist Council/Salvation Army Dialogue, serves on the Evangelical Lutheran Church in America/United Methodist Church Bilateral Dialogue, and is a Benedictine Oblate of Mt. Angel Abbey in Oregon. He serves as president of The Charles Wesley Society. Chilcote is the author of Praying in the Wesleyan Spirit (Upper Room Books, 2001), Her Own Story: Autobiographical Portraits of Early Methodist Women (Abingdon, 2002), Recapturing the Wesleys' Vision (IVP, 2004), Changed from Glory into Glory: Wesleyan Prayer for Transformation (Upper Room Books, 2005), Wesley Speaks on Christian Vocation (Discipleship Resources, 1986), John Wesley and the Women Preachers of Early Methodism (Scarecrow Press, 1991), She Offered Them Christ (Abingdon, 1993; Spanish translation, 1995), and An African Journal of Hope (GBGM, 1998). Chilcote also serves as a unit editor for the definitive edition of The Works of John Wesley, having responsibility (with Randy Maddox) for volumes 12 and 13 on doctrine and theology.